So, I've been bad about posting about our Sew Club meetings... sorry about that. We've been busy the past few months with several different projects. For our next meet up, we've decided to do a project inspired by a shirt from Lucy. One of our sewists recently brought a cowl neck shirt so she's going to teach us how to make this shirt. I'm excited because I've never made a cowl. I'll post again in a few weeks with the results. 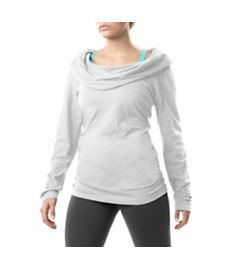 This is the cowl neck featured in a recent Lucy email. Kind of cute, huh.